Mary was born January 14, 1926 in Girard, Kansas, the daughter of Frank and Mary K. Turkington. The family moved to the farm near McCune, Kansas on Mary’s second birthday. Mary received her Bachelor of Science Degree from the University of Kansas. She was in the first graduating class of the William Allen White School of Journalism in 1946. Mary’s professional life was involved with the highway transportation. She was a member of the staff of the Kansas Motor Carrier’s Association from August 1946 to February 1997. 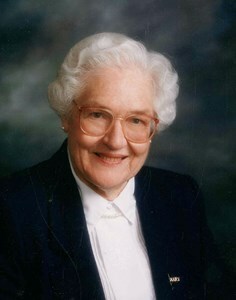 She was Executive Director from July 1968 until her retirement. Mary represented the highway transportation industry before the Kansas legislature, state and federal agencies and related organizations. She participated in the American Trucking Association national programs, earning the Earl Dove Award; the highest honor the ATA bestows. After retirement from KMCA, Governor Bill Graves appointed Mary to the Kansas Turnpike Authority, where she served for four four year terms under Governor Graves and Kathleen Sebelius and Mark Parkinson. Other special honors include KU Woman’s Hall of Fame in 1976; Junior Achievement of Kansas Business Hall of Fame 2014; 1978 Woman of Achievement Kansas Press Women; 1992 Woman of Excellence; YWCA Leadership Program and in 2018 she was inducted into the Shawnee County Baseball Hall of Fame. Extended family survivors are daughters, Judith Grant and her son Mitchell, Lawrence; Jean Myers, Topeka; son, Jerry Taylor (Syl) and their three daughters, Kim, Stacy, and Jennifer and families. Other survivors include nephew, David Turkington (Mae), Utah; nephew, Tyler Turkington (Erica) and family, Olathe; niece, Debbie Innes (Ron), Wichita; and her daughters, Kim Jones (Shelly), K.C., MO; Kerry Lea Connolly (Ron), Topeka and daughter Haley; sister-in-law, Edris Turkington, Silver Springs, MD and her daughter Becky Congdon (Shaun), New York; Susan L. Turkington, M.D., Fairfax, VA; niece, Janie Turkington, and nephews John Turkington, Randy Johnson, McCune, Kansas and his children Karen Williams (Eddie) and Chris Johnson; Dr. Mary Menninger-Corder, Topeka, KS and her children Amy, Dr. Ben, Zack and Alex and her sister Janet Turner (Geoff) and brother Charles. Memorial contributions may be made in her name to the Kansas State Historical Society, Emily Taylor Center for Women and Gender Equality at the University of Kansas, First United Methodist Church in Topeka and may be sent in care of Penwell-Gabel Mid-Town Chapel, 1321 SW 10th Ave, Topeka, KS 66604. Add your memories to the guest book of Mary Turkington. Mary was a very special person and a loyal friend to many people. She loved Kansas and dedicated her life to the state. She was a true inspiration to all women. She was not a radical feminist but led the way by showing her strength and working harder than most people do. By so doing, she paved the way for many women to follow. Part of what made her so loved and so successful was that she never forgot your name and she used it freely when talking with you. She made you feel special. That was indeed part of her professional success. She was a unique person. She was a woman like no other. The times I spent with Mary were among my most cherished memories. May God bless her soul. And thank God we had her for awhile. I was blessed to share the leadership of Economic Lifelines, which Mary helped found, with Mary from the mid 1990s until about 2012, when we both retired from our roles. She was so gracious, but also so wise, and knew the workings of the Kansas legislature better than anyone living! I knew the construction industry pretty well, but had little political experience. Mary was my mentor and I was a proud and appreciative partner. We helped in the process of bringing the Kansas highway system up from one of the bottom 5 of all 50 states in the 1980s to one of the top 5 by 2012. To a large degree that is a legacy of Mary Turkington's . A very special lady. Mary was a mentor & role model for me in my career as trying to be a female leader in the law field where it was primarily male in the 1970's. I loved her immediately when I met her during Legislature sessions in Kansas. She will be solely missed but always remembered. I met Mary in her role as a trustee of the William Allen White Foundation. As dean of the School of Journalism and Mass Communications at KU, she was one of the first people I met. Her advice was wise and practical. As a woman who had done a lot of "firsts," Mary was a great mentor for many of us. Her smile was that of a good and gracious person who knew how to get things done. I will miss her. I came to know Mary as a teenager and she was a wonderful role model. My Dad Leslie Unruh was a member of KMCA, past President and served on several boards with Mary. Mary was a true inspiration to me, encouraged me to find my passion and live it and even made a trip to southwest Kansas for my High School Graduation. Mary will most certainly be missed by many. She touched the lives of many and he ripples of this will continue for generations to come. I was young and impressionable when I met Mary Turkington. My father, A.L. Branson owned Branson Truck Line in Lyons KS. My Dad and Mary worked on legislative issues during the years of deregulation of the trucking industry. My father also served with her on the ATA Board. Her presence and name was commonly felt and spoken in our home. She made such an impression on me and always made my sister and I feel very important when we would visit her at her office. Our deepest condolences to Mary's family and those who worked with her. Rest well Mary, you are in good company. God Bless. I am saddened to learn of Mary's passing. I met her in the late 70's. through our legislative endeavors. Mary was a classy, bright and special lady. One of a kind. She set a wonderful example by treating everyone she encountered with respect. My deep condolences to her family. To Ms. Turkington's family & friends, please accept not only Elena's & my deepest heartfelt thoughts, prayers & condolences on her passing, but our thanks for sharing her with us & our fellow citizens of our City & State. She was a tireless advocate for her industry and we are all much the better. Mary was a tireless champion of many causes, and a good and loyal friend. She shall be fondly remembered and sorely missed. We are so sad for your loss of this remarkable woman with her ever-present smile. She will be missed. I hope your memories of her fill your hearts and minds with love, peace, and strength at this time. Take care. To all the family: Our deepest condolences to all of you in the loss of Mary Turkington. She sounds like she has lived a life filled with profound accomplishments,plus giving lots of love. May God bless all of you with happy memories. Marvie and Larry Sneegas. Mary always had a smile for everyone. She was like a mother to our family, and grandmother to our three daughters. We were blessed to have been able to share her life with laughter and so many memories. I was privileged to serve as Mary's Pastor for 16 years. Her sweet Spirit was an inspiration to me and two other members of the congregation. She will be greatly missed. Mary was a tremendous role model - a poised, articulate, class act that demonstrated genuine kindness, respect and professionalism in all aspects of life. She was one of the finest ladies I’ve been blessed to call a friend. As her family may you find comfort in the support of all that loved her.